In this section, Wabash Valley Wonders goes on the road to discover Indiana places well worth a visit. Boutique shops, a great place to satisfy the sweet tooth, and a stop to snap up some alligator bites – Jasper has all these and more. For the Hoosier traveler looking for a stay-cation, the city offers items for the foodies, the history buffs, and the shoppers. A recent visit was too brief to hit all that Jasper has to offer, so this article will touch upon just a few. 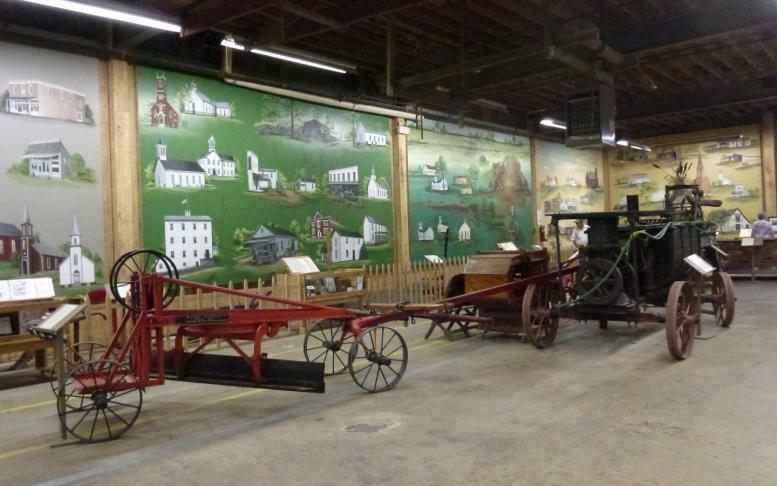 For history buffs, the Dubois County Museum at 2704 Newton St. offers an amazing tour through the past, from fossils to log cabins to the milling industry. The modern entryway doesn’t quite prepare the visitor for the expansive collection, one of the largest county museums in the state. The Main Street exhibit has 17 rooms displaying a turn-of-the-century newspaper, shoe shop, barber and bank. Look for the dog-operated butter churn in the agricultural section. 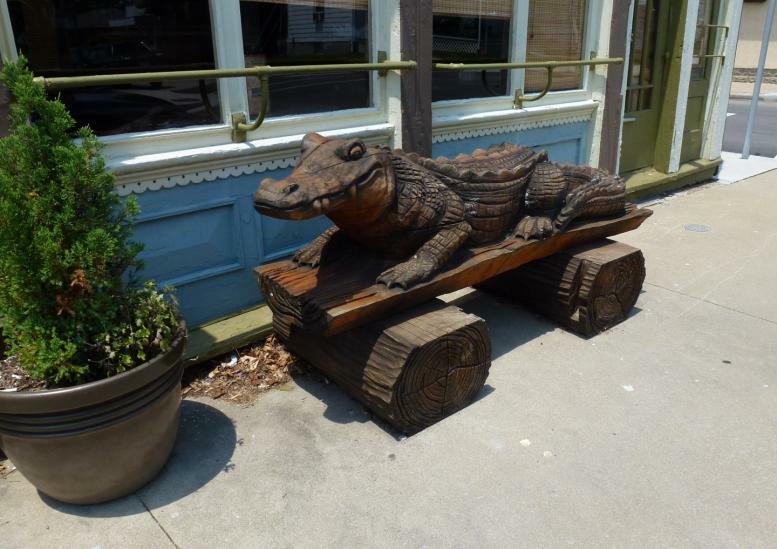 The wooden alligator outside Snaps Restaurant at 1115 Main St. greets customers to an establishment that started as a saloon and boarding house in 1872. The tin ceiling tiles and the layout of the restaurant hearken back to that time. Snaps keeps a collection of private beer mugs hung on the walls for all the regulars. As for their food, the alligator bites with the boom boom and honey mustard sauces were great, and the steak nachos made nice starters. The turkey burger was nicely seasoned, and the mandarin and pecan salad was delicious. The waitress was warm, funny, and helpful. Give Snaps a try. Shopping on the courthouse square in Jasper revealed hidden treasures and unique items. At Indigo Roots, check out the beautiful glassware, items for dog lovers, and the large birdcage in the window. Next door at Just Whimsy are unique ladies’ clothing and accessories and exotic candles, among other items. The L.H. Sturm Hardware Store has been in the family for three generations and is well-stocked with items for the handyman and some unique items modern chain hardware stores don’t carry. On a hot summer day, the ice cream at Chocolate Bliss, tucked in a corner next door to Sturm Hardware, hit the spot. The ice cream is freshly made locally and several flavors are available. However, it’s the case full of Chocolate Bliss’ own chocolates – cream filling, truffles and caramels – that cause the chocolate lover to drool. The shop also carries specialized cooking utensils and flavored oils, among other items. The day was too hot to enjoy the Riverwalk, a 2.1 mile paved path along the Patoka, and the Jasper City Mill alongside, but Wabash Valley Wonders hopes to make another visit to Jasper in the future. After a recent long drive, a stopover in Nappanee was a welcome treat. 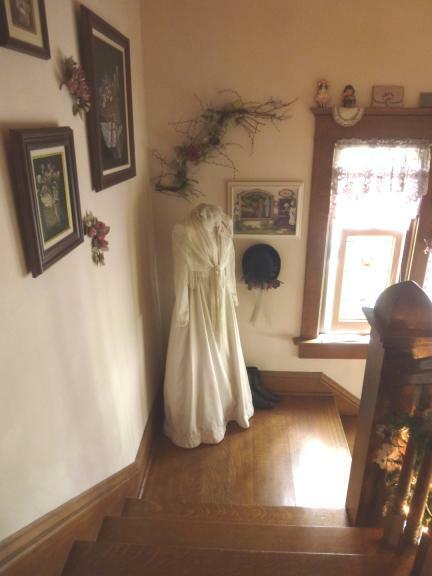 From the bed & breakfast, to local eateries, to the profusion of flowers in the quilt gardens, Nappanee is an enjoyable visit for travelers in Indiana. Due to a late arrival in Nappanee, it was necessary to head quickly to Amish Acres at 1600 W. Market St. to sample their Threshers Meal before the restaurant closed for the evening. If visitors arrive early in the day, they can visit the nearby cheese and fudge shop, a shop for home gift items, and take a horse-and-buggy ride and tour of the farm. 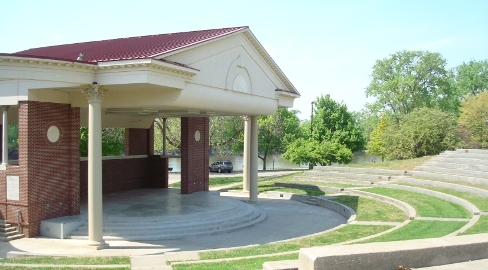 The complex also contains a theater where tourists can take in a play in the evening. The Threshers Meal is hearty down-home cooking served family style. Diners pick two meats from a choice of ham, fried chicken or roast beef (which is really so tender it’s almost like pot roast). The opening round consists of ham and bean soup, freshly baked bread with butter and apple butter, pickled vegetables, and sweet and sour cabbage salad. With the meats come stuffing, mashed potatoes and gravy, beef and noodles, and green beans. On top of that is a choice of dessert – anything from crème brulee to fruit pies and cream pies. 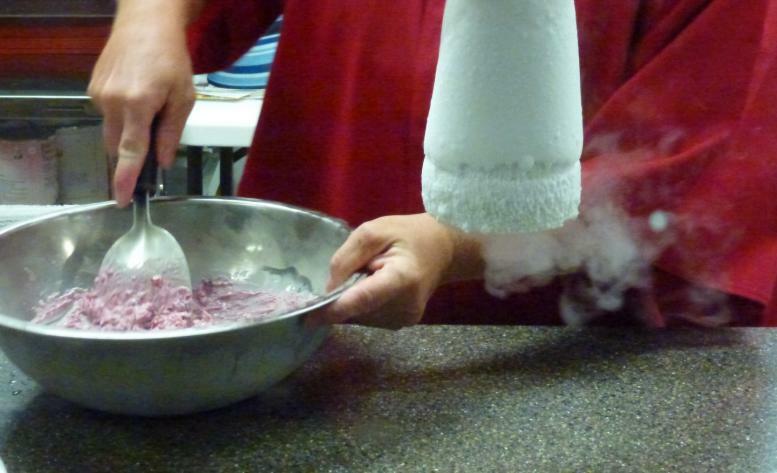 For another unique treat, try Rocket Science Ice Cream, located in Coppes Commons at 401 E. Market St. in Nappanee; it’s been featured on Ice Cream Nation on The Cooking Channel. Pick a flavor, and your order is whipped up right before your eyes with a blast of liquid nitrogen. Want to try unique flavors like key lime pie, pina colada or s’mores? Rocket Science has more than 50 ingredients to choose from. Then it was on to a good night’s rest. The exterior of the Homespun Country Inn at 302 N. Main St. is inviting, from the early 1900s architecture to the little garden in back. On the first floor, a parlor facing the street contains furniture upholstered with seemingly endless shelves of books in the fabric. It’s a perfect spot to curl up with a book, or perhaps work on the community jigsaw puzzle. Another room in the parlor area offers additional seating and magazines to read. The bedrooms upstairs are decorated in the whimsy of an earlier era, with lace and an old-fashioned quilted spread. Sally's Room, named after an original occupant of the house, is large, comfy, and the bed provides an ever-so-good night’s sleep. Breakfast the next morning was a tasty, light and balanced meal of an egg casserole, fresh fruit, yogurt, a cranberry muffin and raisin toast. Seeing the two quilt gardens in Nappanee was enhanced by talking to a volunteer tending one of them. Designs for the 19 flower gardens along the Heritage Trail in Elkhart County must be approved by a committee, and each year a team of volunteers plants and cares for each floral quilt. The combinations of flowers, greenery and herbs are well worth the stop for visitors in Indiana. The visit was all too short. Stay tuned; Wabash Valley Wonders will explore more of the area on another trip.